Penguin Books Ltd. and Viking. Zlatan Ibrahimović, with Mats Olsson, presents his career autobiography that chronicles a journey from his childhood in Malmö, Sweden, to his most recent destination in Los Angeles, California. Work hard, conduct yourself properly, be serious and stay focused. That is the advice I can give." 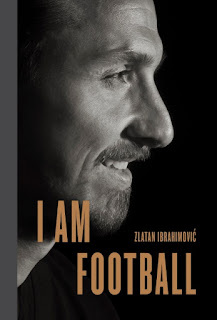 --- Zlatan Ibrahimović, author of Jag är fotboll ("I AM FOOTBALL"), quoted in the Foreword, published in November 2018 by Viking, an imprint of Penguin Books Ltd., with a list price of £25. I recall the first time I saw this big, tall, technically-gifted Swedish player with the strange name. It was the Euro 2004 group round match versus the Azzurri. Zlatan scored an audacious backheel winner that ultimately put the sword to the Italians in the tournament. A few months later, he transferred to Juventus from Ajax, and the rest as they say, was history. With thirty-three trophies, eight club teams and the national team of Sweden, Zlatan Ibrahimović has indeed travelled a long journey in world football. I struggle to recall any modern-day player such as he who has had as much influence on the pitch as off of it. This book is encyclopedic in presentation, both in imagery and text, and as unique as its protagonist. We witness the ascent of a world-class player who has challenged himself every step of the way. Many words have been used to describe Zlatan. Professionalism is one that we don't hear with enough frequency. At every stop in his tremendous career, he gave 100 percent for the shirt on his back, the club President who paid his wages, along with some of the most elite managers in world football. For me, that is the epitome of a true professional. Let's take a longer look at this provocative, educational and entertaining book. The book itself is physically heavy similar to a law school text or an encyclopedia. The tactile feel immediately tells you that this is going to be a unique reading experience. There are 256 pages of text according to the publisher although it seems much longer. This book is not structured in the usual fashion with sequential chapters and page numbers. There is a Forward by Zlatan, his Dream XI, followed by lengthy sections for each of his professional clubs (with the exception of the LA Galaxy.) To cap things off, we have the brilliant addition of "Zlatistics," which documents every professional game he has ever played in acute detail. Did you know that he has converted 88.60 percent from the spot over his long career? Now you will along with a voluminous amount of other statistics. Zlatan communicates in a personal, engaging and detailed style. I saw him appear on an American television talk show and he said, "I was taught never to lie." You see that quality in this book. Zlatan paints a true portrait of himself with observations and insights about every club where he has played. He is secure in his place in this world. His attitude is a refreshing one: Facts and not opinions. After reading many of his recollections with famous managers, we see his intellect at work with a nearly verbatim memory of exact conversations. And so he'd stand me in front of goal, every day for two whole seasons, practising my finishing. After training, when everyone was heading for the showers, I'd hear him roar: 'Ibraaaa!' and then just point. He didn't say much, it was more this power he had. It was enough for him just to look at me..." --- Quoted in the section about Juventus FC. I was supposed to say, 'I want to leave,' because if I said it myself he would be able to blame me." --- Quoted in the section about FC Barcelona. Mats Olsson is a Swedish journalist based in New York City. He has covered Zlatan's career from the start. His contribution to this book was significant both from a journalistic aspect along with a personal one. His interviews with managers who knew Zlatan from the very beginning, such as Roland Andersson and Ronald Koeman, and during his ascent to a world-class player, such as José Mourinho, provided an added bonus. Mats also had discussions with many star teammates of Zlatan such as Thierry Henry, Henrik Larsson, Andrea Pirlo and Patrick Vieira, respectively. These interviews, and other written contributions made by the co-author, added a journalistic structure that enhanced the overall visual appeal of this project. We are able to see how Zlatan is perceived by teammates and rivals alike. Michael Gallagher translated this book from the original Swedish version. He brought Zlatan to life using British English in a superb fashion. The vast array of high-quality photographs add significant value on their own. Zlatan shares his ascent in world football with a photographic journey par excellence. You can see that a tremendous amount of time went into selecting these images, at various stages of Zlatan's career, to complement the excellent written content of this book. "At sixteen, seventeen, you could see that his mind was made up, he was going to be someone. He did extra runs, he'd be out on his own somewhere running up some bloody hill. I didn't have that desire or mentality. That's what separates a world-class player from an ordinary one --- that desire to be the best, to be a winner." --- Gudmundur Mete, a teammate at Malmö FF. The day people stop talking about Zlatan, he'll be dead... If I am the one who made Zlatan, then he's the one who made me --- we made each other." --- Carmine "Mino" Raiola, his agent, quoted in the section about AFC Ajax Amsterdam. I think he can be whatever he wants to be in the game because he knows everything that's worth knowing." --- José Mourinho, his manager at FC Internazionale Milano and Manchester United, respectively, quoted in the section about FC Inter. "What people forget, what they always fail to mention, is his brain. He's got a real footballing brain. He reads the game so well that he can predict what's going to happen. With all his ability, he can do what needs to be done, but his brain understands what's about to happen long before anyone else's. Add his strength and talent --- you have Zlatan Ibrahimović." --- Thierry Henry, a former teammate at FC Barcelona, quoted in the section about the Catalan club. I think Zlatan's going to enjoy playing in America, not just in terms of the football but also the lifestyle. MLS in only going to get better. I think football can be built up into something really great over there and that should be a huge opportunity for Zlatan, another new challenge." --- Andrea Pirlo, a former teammate at AC Milan, quoted in the section about the Milanese club. "But even I fell out with him at times, and one time in particular sticks out. It was at PSG, and we couldn't agree on something at training. Afterwards I was checking my phone and he came over and said, 'That was a mistake, the first mistake of my life was to row with you, Thiago.' No worries, I said. That was the end of that. He was a big role model at PSG, and a huge help." --- Thiago Silva, a former teammate at AC Milan and PSG, respectively, quoted in the section about Paris Saint-Germain. Italy turned Zlatan into a great player. Italy is like a tactical school, and Zlatan had to develop his game in order to keep up when he moved there. I'm not surprised Zlatan was so good for so long. I saw him train every day for all those years --- I know what he is capable of." --- Maxwell, his eternal teammate at Ajax, Internazionale, FC Barcelona and Paris Saint-Germain, respectively, quoted in the section about the Parisian club. It was a good thing that he had people to chase in the national team, he's driven by this desire to be number one on every level." --- Henrik Larsson, a former international teammate, quoted in the section about the Swedish national team. I was provided a review copy by a representative of the publisher, Viking. I was not financially compensated by the author, co-author, publisher or any party who would benefit from a positive portrayal. I discussed this book briefly with David Amoyal at Calcioland beginning at 1:12:00 in the broadcast. Pep Guardiola: "Tomorrow will not be FC Barcelona versus Ibrahimović." Translated Excerpts from "I am Zlatan Ibrahimović"